Google Drive may be something you use from time to time with your remote team. But have you considered making it the heart of your operation? Working remotely can get cumbersome when you’re constantly sharing files back and forth with email. Different versions of the same project pass each other in the mail, and hard drives fill with exotically re-named updates to stuff you’ve been working on as a team. But remote is the best way for many digital organizations, because it saves money on office space, allows your colleagues to travel and be a part of what’s going on in the industry instead of being bound to a desk, and it means you can work with the best professionals around regardless of their location. So instead of getting bogged down in electronic paperwork and using Google Drive just for the occasional big file drop, why not try moving your whole ‘office’ into the cloud? People who haven’t yet waded deep into the waters of Google Drive tend to regard it as little more than a file-sharing service. But Drive is seamlessly integrated with other Google services and software such as Docs and Sheets. And these services not only deliver the kind of performance you would expect from Google’s rival to Microsoft Office, they add lots of extra features too. Google retains that cutting-edge approach to technology that Microsoft has lacked in recent years, so there are all sorts of functions and gadgets hidden in the Drive that put its usability way above traditional tools. Unfortunately, ‘hidden’ is just the word. A lot of what’s going on under the hood of Google Drive is missed by its users, because having grown up with Office it’s all too easy to just use Docs and Sheets in the same way, without expecting anything more. 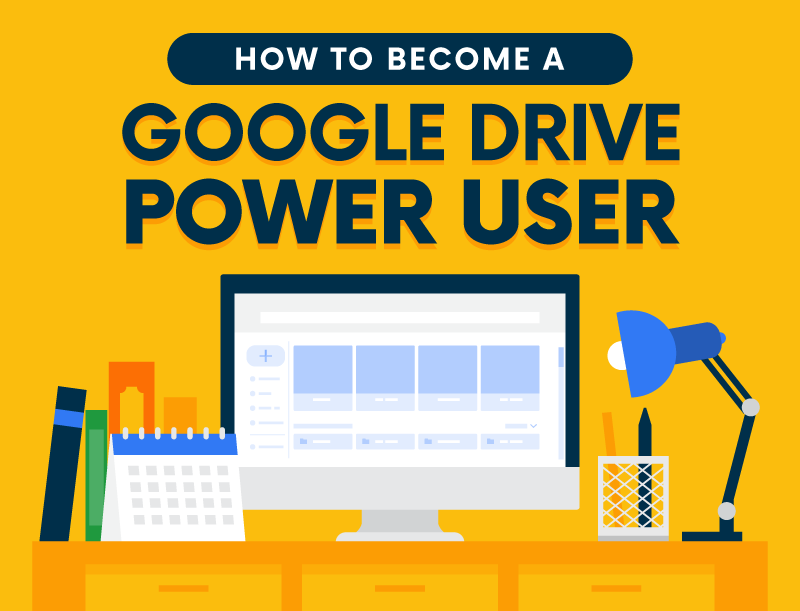 This new visual guide to Google Drive from NetCredit illustrates some of those hidden features so you can start to figure out how to make them work for your digital business. Part of the power of Google’s cloud storage is that you can keep so much there. You can grab 100GB for just a few dollars a year. And so Google is able to hang on to multiple versions of the files you create. Yes, you’ll see your Docs file updating and saving in real time in front of your eyes as you and your distant colleagues work on it. But did you know you can find all those intermediate versions by clicking File > Version History? This brings up a list of time-stamped versions which you can easily check for metadata, and restore if appropriate. You can even rename those versions in storage to make them easier to refer back to if you’re working on a project with lots of edits. Docs is also willing to function with other formats. You can upload an MS Word document to Drive and then convert it to a Google Doc just by opening it. Or you can save a Google Doc as a Word Document and download it to use on your desktop. Plus, you can convert files to pdf, or edit pdfs and images right in your word processor. But where Docs really comes into its own is the way it relates to Google’s other services and tools. For example, Google is now the go-to translation software for many professionals. So naturally, you can translate your document to another language right there in the drive. Perfect for when you’re working with remote colleagues without a shared language, or if they are delivering social media content that you’ve created for a different demographic. And Google’s spooky ability to listen to everything works in your favor, since Docs has a very powerful voice dictation service. Not only will it recognize and transcribe every word you say when you ask it, but you can use voice commands to add formatting or move around your document. If you’re really bold, you can even try to use it to transcribe a talk or meeting that you had taped! Of course, work isn’t all fun, and sometimes you need to crunch numbers too. (Okay, so some weirdos find this fun). Thankfully, Google Sheets exists as a cloud-based alternative and improvement to Excel. Of course, it’s perfectly integrated with Drive and Docs, so you can use it with your new system just as you used to use Excel within your Office suite. In some ways, Sheets is a bit more usable than Excel, too. For example, if you’re not an everyday user, you’ll be pleased to know you can select some relevant cells and just hit ‘Explore’ to be offered a range of options on the most appropriate calculation to carry out. You can create QR codes to make it easier to navigate around your records if you have reams and reams of data saved into your spreadsheets. And you can even set it up to send you an email notification if something is changed in one of your sheets. If the thought of putting your company’s financial records and business plan in the cloud worries you, fear not! While of course you can make your project shareable among your remote crew if you want, you can also alter the privacy settings on a minute level so that only the people you want to see certain parts can do so. Ready to ascend to the cloud? Go for it!